Stems 1-2.5 m, ± glabrous proximally, tomentose distally. 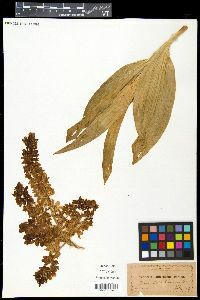 Leaves ovate, distalmost lanceolate to lance-linear, 20-40 × 15-25 cm, reduced distally, tomentose-ciliate, curly-hairy abaxially, glabrous or veins sparsely short-hairy adaxially. 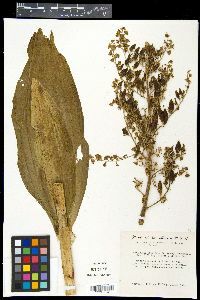 Inflorescences dense-paniculate, with spreading to stiffly erect branches to near tip or distal 1/3-1/2 unbranched, 30-70 cm, tomentose; bracts ovate-elliptic to lanceolate, shorter than to obviously longer than flowers. Tepals creamy white, greenish basally, lanceolate to elliptic or oblong-ovate, not or very slightly clawed, 8-17 mm, margins entire to denticulate, glabrous to abaxially tomentose; gland 1, basal, green, V-shaped; ovary glabrous or with few hairs; pedicel 1-6 mm. Capsules narrowly ovoid, 2-3 cm, glabrous. Seeds flat, winged, 10-12 mm. Different geographic elements of Veratrum californicum have been described as separate species or varieties. The variation seems to be clinal, with most variants not consistent in their appearance or distribution. We have recognized two varieties that appear to be fairly consistent in their distributions and characteristics. Western Native Americans (Blackfeet, Paiute, Shoshone, Thompson, and Washoe) used this species as an antirheumatic, poison, contraceptive, and emetic, as well as a skin, respiratory, blood, cold, snake bite, throat, and toothache aid (D. E. Moerman 1986). Duration: Perennial Nativity: Native Lifeform: Forb/Herb General: Stout, herbaceous perennials, to 2 m tall, stems tomentose above, glabrous below, plants arising from short, thick rhizomes. 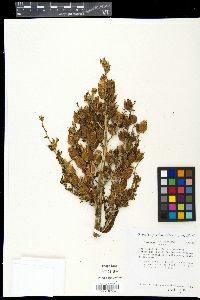 Leaves: Clasping, broadly elliptic to ovate to linear-lanceolate and reduced above, many-veined and pleated, 20-40 cm long, 8-20 cm wide, curly tomentose beneath. Flowers: Greenish-white, many unisexual, perianth segments 6-15 mm long, oblong-ovate to oblanceolate, obtuse or acute at the tips, stamens 6, almost as long as the perianth, styles 3, flowers numerous in dense panicles, the pedicels 2-6 mm long, both at branch tips and branching at rough right angles below. Fruits: Three-lobed capsules 20-35 mm long. Seeds 10-12 mm long, strongly winged. Ecology: Found in bogs, meadows, and wetted areas, from 7,500-9,000 ft (2286-2743 m); flowering July-August. Distribution: Montana to Washington, south to New Mexico and California. Notes: This is the only species of this genus in Arizona. The corn-lily looking leaves and greenish-white flowers are a dead give-away for this plant. Synonyms: None Editor: LCrumbacher 2011 Etymology: Veratrum comes from the Latin for "dark roots" and the ancient name of the Hellebore, while californicum means of or from California.